Instead of making separate trip reports for each spring backcountry hike and ski/snowboard trip that my friends and I do, I thought I'd just make a page with some of my favorite pictures from various hikes this spring in the San Juan Mountains of Colorado. 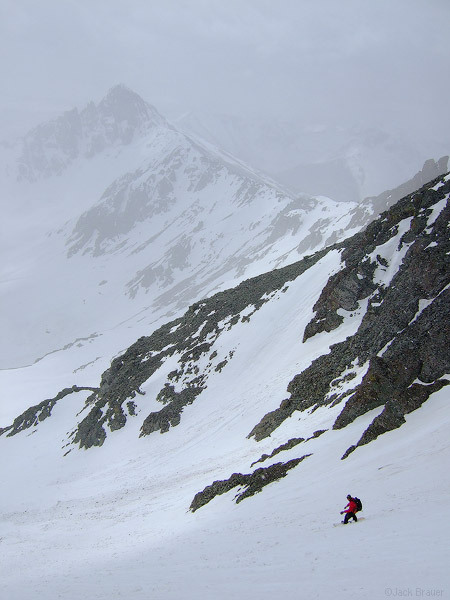 Snow conditions have been a bit peculiar in the San Juans this spring. A long dry spell in early April seemed to forecast an early spring season, but in April and May, we had almost weekly foot+ snowfalls. These dumps provided some great late-season powder and also really helped to preserve the snowpack. 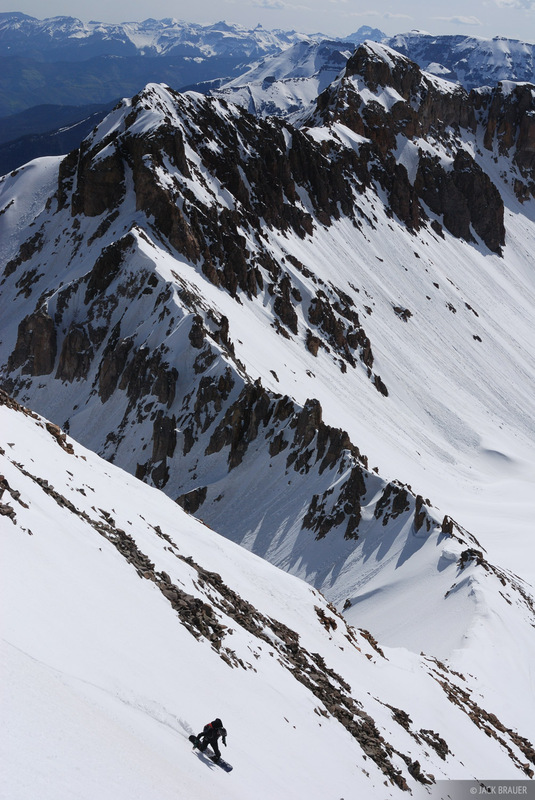 Unfortunately several of the last big dumps in May just sluffed right off the steep slopes, leaving piles of chunder than rendered many of the steeper couloirs unrideable. 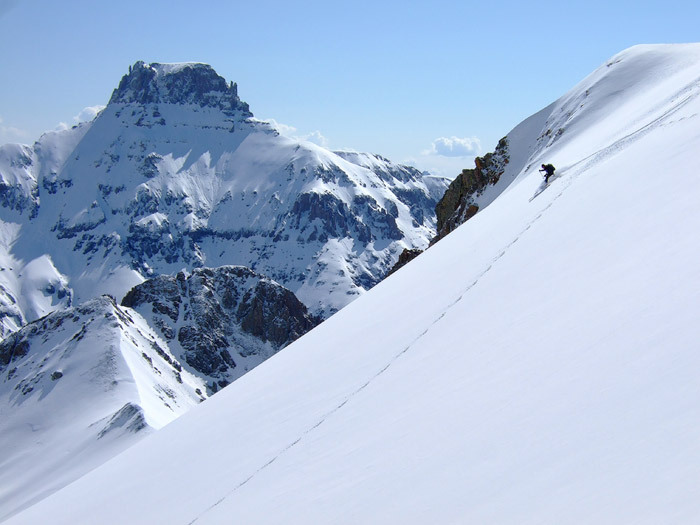 Though some good steep and smooth lines still remain, the best snow conditions have generally been found on long, lower-angled slopes. Teakettle Mountain at far left. Photo © copyright by Jack Brauer. Potosi Peak towers in the background. Skier: Jeff Skoloda. Photo © copyright by Jack Brauer. 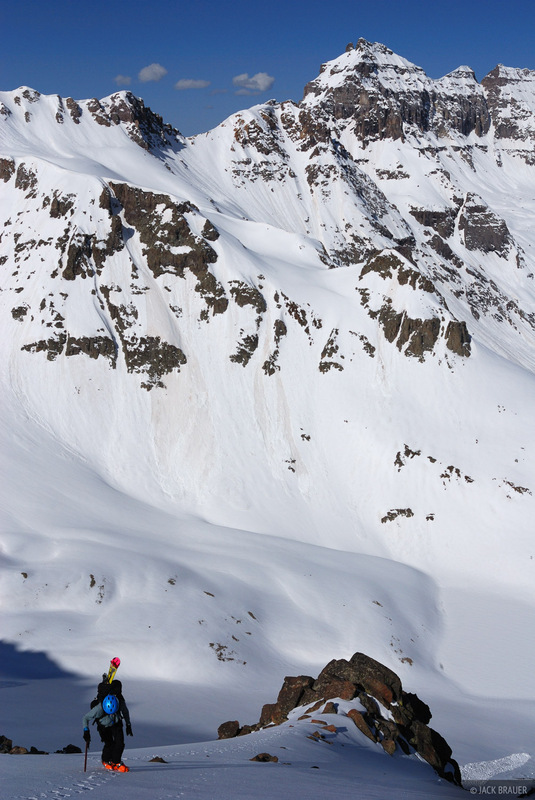 Skier: Jeff Skoloda. Photo © copyright by Jack Brauer. 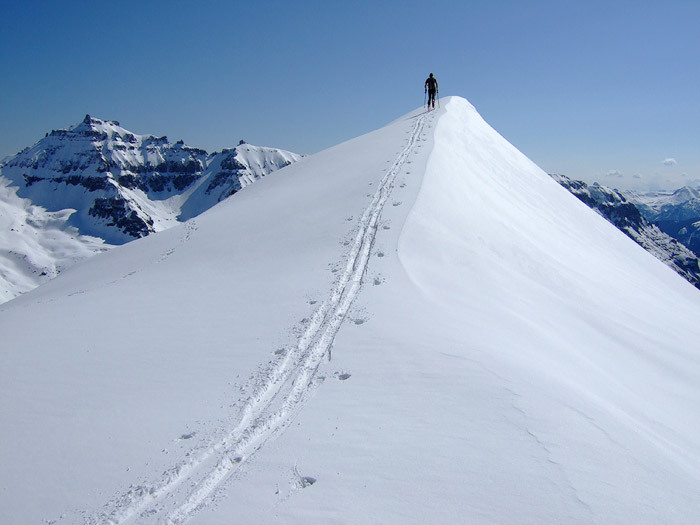 Hiking towards South Lookout Peak. 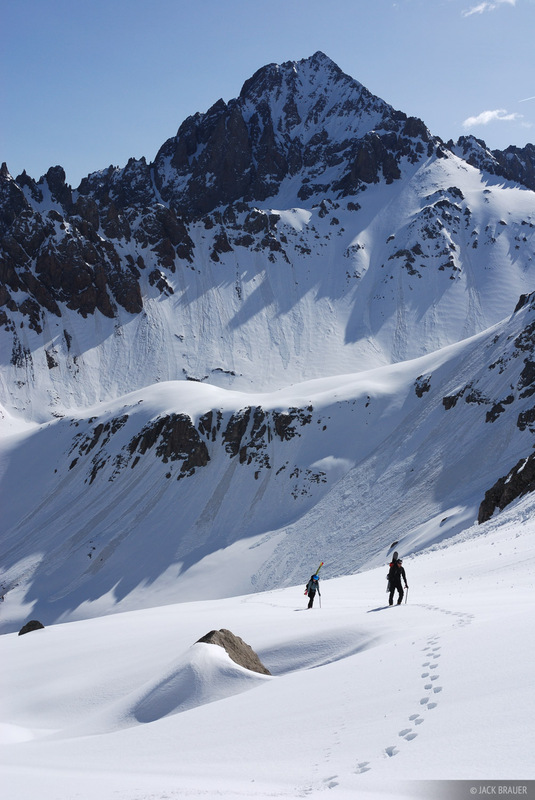 We hiked and rode down the couloir of the prominent notch of the peak. Photo © copyright by Jack Brauer. 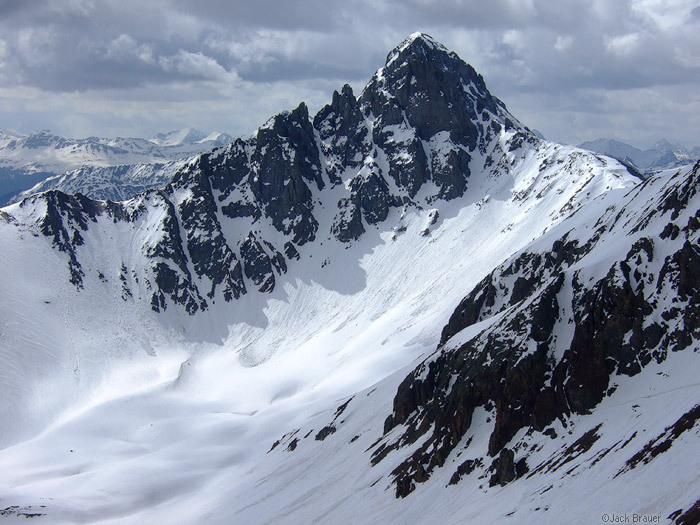 a beautiful unnamed peak near Ophir Pass. Photo © copyright by Jack Brauer. Riding down South Lookout Peak - May. Rider: Jason King. Photo © copyright by Jack Brauer. Hiking up the west side of Blue Lakes Pass on the shoulder of Mt. Sneffels - May. Dallas Peak is in the background. Photo © copyright by Jack Brauer. 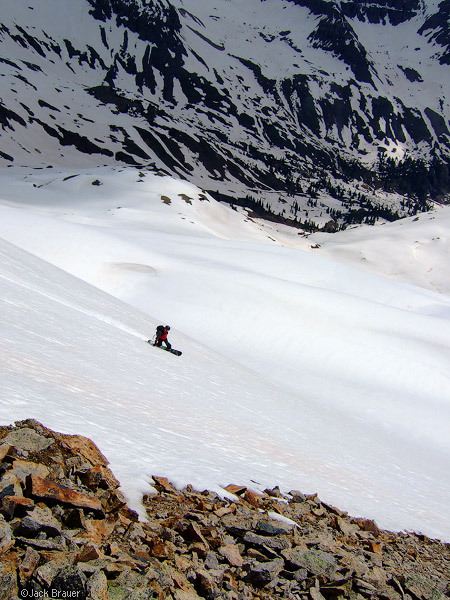 Snowboarding down the steep and smooth western slope of Blue Lakes Pass - May. Rider: Parker McAbery. Photo © copyright by Jack Brauer. Hiking the East Dallas Drainage with Mt. Sneffels towering in the background - May. Photo © copyright by Jack Brauer. 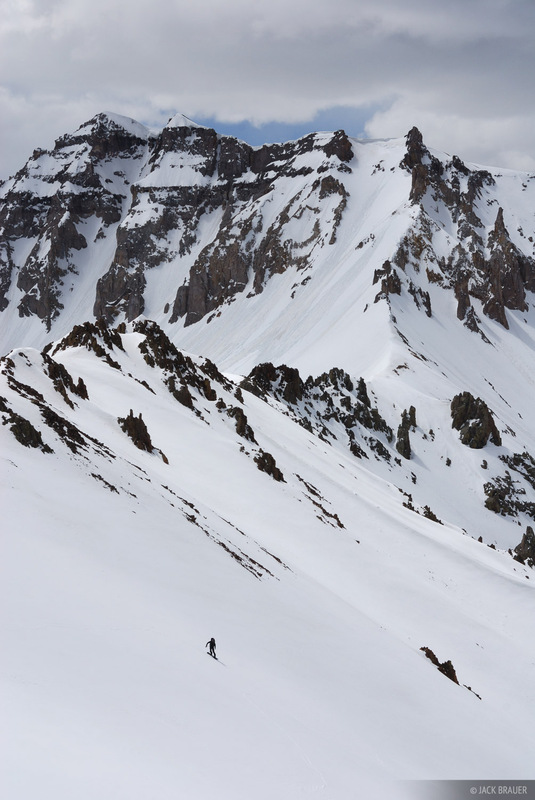 Snowboarding down "S5", 13,380 feet, in the Sneffels Range - May. Rider: Parker McAbery. Photo © copyright by Jack Brauer. 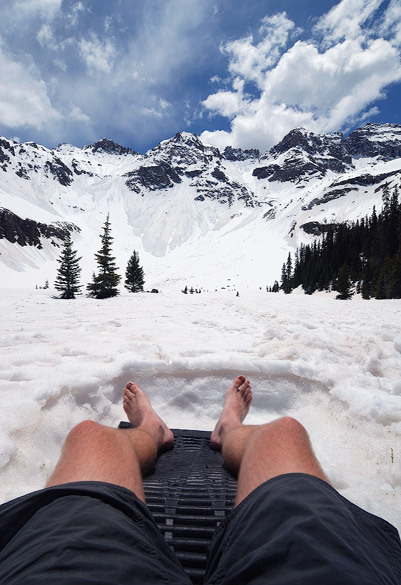 Relaxing in my custom-made, ultra-ergonomic snow lounger. Photo © copyright by Jack Brauer. 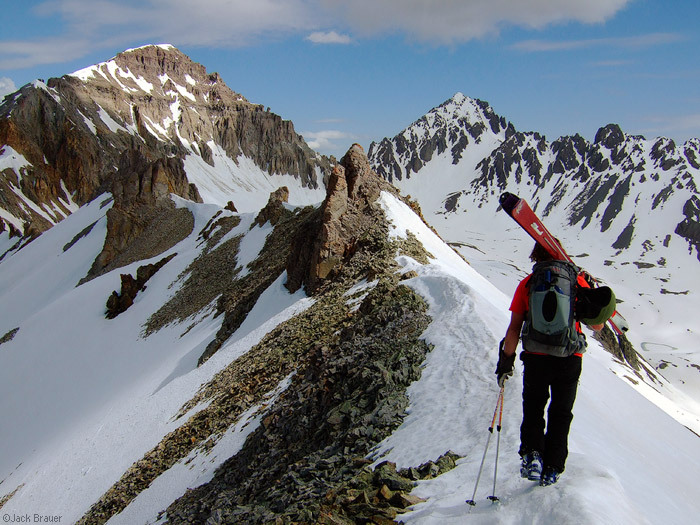 Hiking a ridgeline high above Yankee Boy Basin, about to ski down - June. Gilpin Peak on the left, and Mt. Sneffels in the distance. Photo © copyright by Jack Brauer. 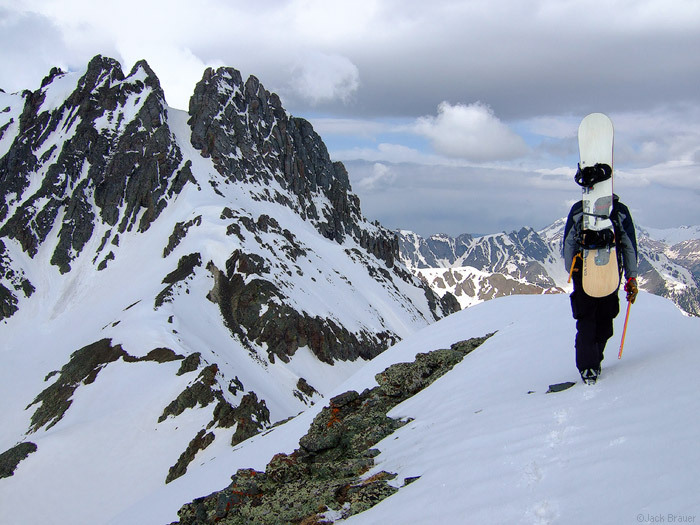 Snowboarding down into Yankee Boy Basin - June. Rider: Jack Brauer. Photo by Jason Greer. Photo © copyright by Jack Brauer. Check out the photo reports page to see more pictures from other spring descents. 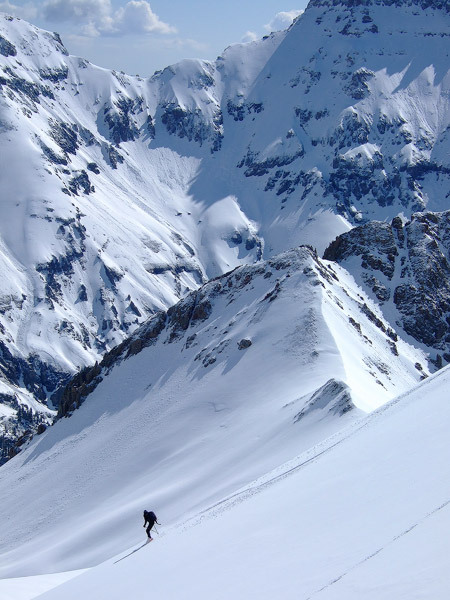 Posted in Colorado, Skiing & Snowboarding and tagged Colorado, San Juan Mountains.